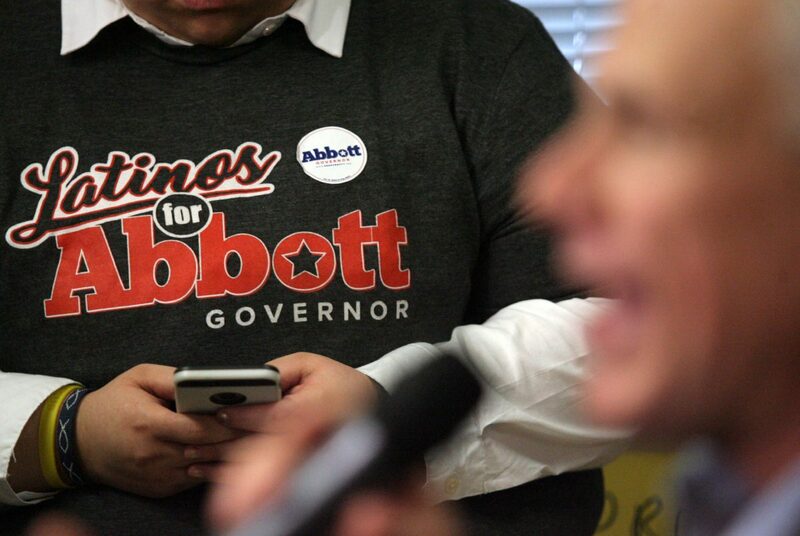 A Greg Abbott supporter listens to the governor as he speaks at the Hidalgo County Republican Headquarters on Wednesday, Feb. 28, 2018 in McAllen. Abbott was in town to get out the vote. McALLEN — With news of record-breaking turnout among Democrats across the state this election season, Gov. Greg Abbott made a stop here to make a push for Republican supporters to vote. 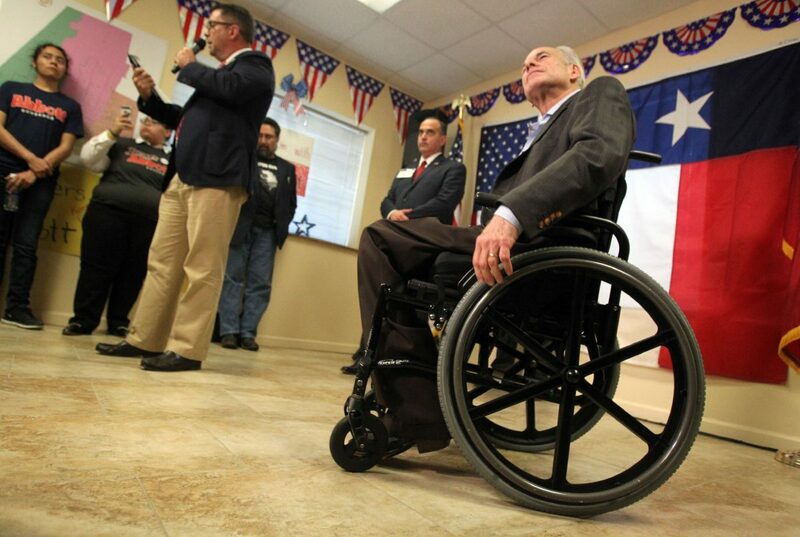 Abbott, appearing before a crowd at the Hidalgo County GOP Headquarters, began by repeating the contention that no other governor has visited the Rio Grande Valley, traditionally a Democratic stronghold, as often as he has. Abbott stumped specifically for Ernest “Ernie” Aliseda, running for chief justice of the 13th Court of Appeals, and Jaime Tijerina, running for Place 4 also on the 13th Court of Appeals. Gov. Greg Abbott looks out at the crowd that gathered at the Hidalgo County Republican Headquarters on Wednesday, Feb. 28, 2018, in McAllen. Abbott was in town to get out the vote. Supporters of Gov. 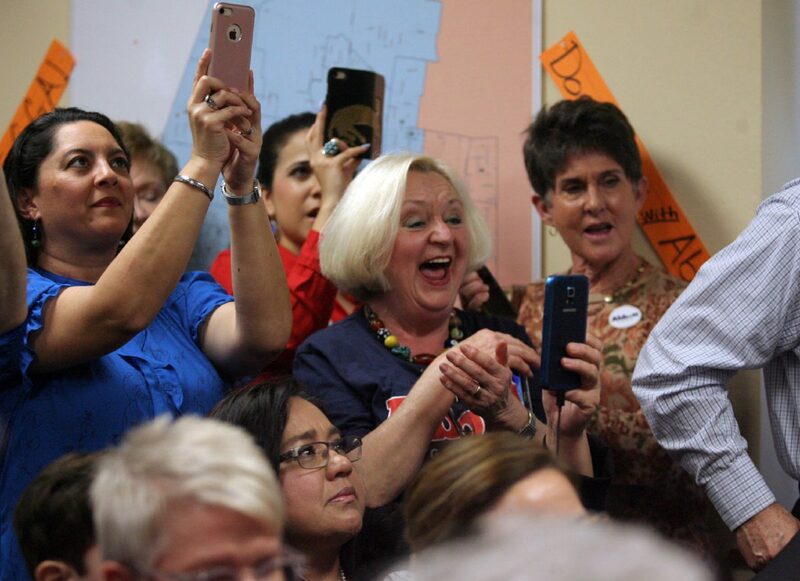 Greg Abbott cheer during a gathering at the Hidalgo County Republican Headquarters on Wednesday, Feb. 28, 2018, in McAllen. Abbott was in town to get out the vote. But in order to do that, the governor reminded the crowd, Republican voters will need to exceed the turnout of Democratic voters which has reportedly surged 200 percent in Harris County alone, according to the Texas Tribune. Abbott also touched on his own re-election campaign, delivering a rundown of a moderate platform that includes more support for veterans through tax write-offs to assist those who launch their own businesses, expanding healthcare access through the U.S. Department of Veterans Affairs, and petitioning the federal government for a VA Hospital in the Valley. He also advocated for raises to teachers’ salaries and assured the teachers in the room that the state would fully fund the teacher healthcare plan. “The time has come to pay our teachers more, to pay them the salary they deserve to teach our kids,” he said, mentioning that his own wife is a former teacher. Abbott also used the opportunity to tout the state’s economic growth in terms of jobs added and rising wages. “The Texas economy has now grown so large that if Texas were its own country, we would have the 10th largest economy in the entire world,” he said to cheers, adding that it was larger than Russia’s economy. “And that makes me more powerful than Putin,” he said, referring to the Russian president.